This section is from the "Practical Building Construction" book, by John Parnell Allen. Also see Amazon: Practical Building Construction. In best work these boards are not nailed down, but are glued together and secured by hardwood buttons underneath, each button being screwed to the underside of the board, and the tongue on them turned into a groove on the joist of the landing, so that the buttons are secured to the joists, and the boards to the buttons, as Figs. 845 and 846. Section on line A B. Fig. .849. The bearers for the winders in a wreathed or geometrical stair are treated in a similar manner. 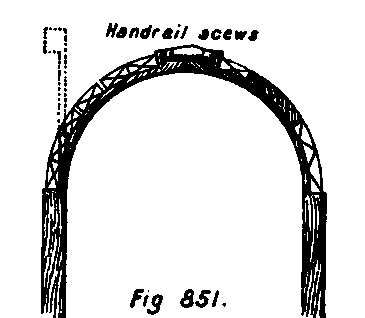 Wreathed stairs (geometrical), with their continuous winding strings, of course are very intricate at the returns; so much so, that the strings and handrail are constructed on a drum, that more accuracy may be obtained, as the string is both circular on plan, and rises at the same time. The back of the string at the return is cut away to a very thin veneer, which is blocked up with wedge-shaped backings from behind; and the joint between the two parts of the string is secured by handrail screws. (See Fig. 851.) It must be borne in mind that it rises at the same time as it goes round. (See Fig. 852.) Carriages and bearers support the steps. 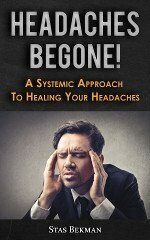 Buil-nosed or curtailed steps are treated in the same manner. See Fig. 853, which is a plan of one of the latter at the bottom of a stair, showing the veneering and blocking to the curve. Occasionally, in best work, the strings are cut and mitred, which is another name for the open string; and, at the same time, gives a clue to the class of treatment to which the string is subject. 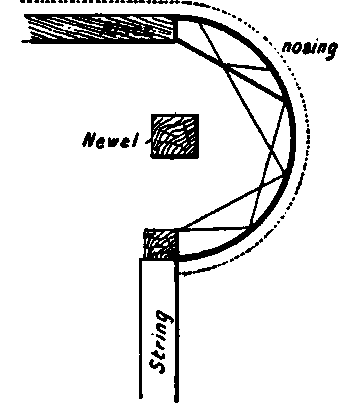 The string (that is, the outer string) is cut out to the shape of the steps (Fig. 854), the ends of the treads are rounded, and the small moulding is returned, as Fig. 855, oftentimes with a small thin cut bracket underneath as a finish. 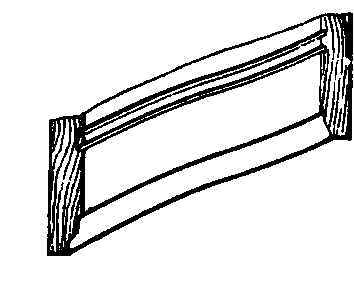 The mitring part, as the term "cut and mitred" implies, comes in with the risers, which are mitred to the string, as Fig. 856. 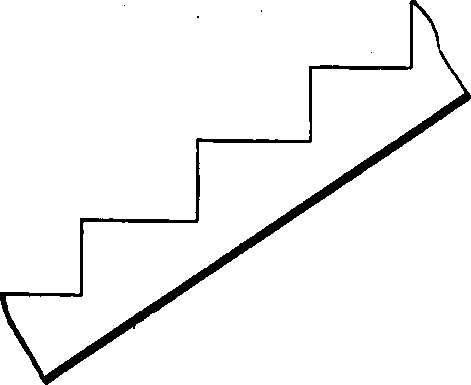 This kind of string is used chiefly in open-newel and geometrical stairs. Sometimes, in wooden stairs as well as stone, solid spandril steps are used, being housed into the strings as usual, but dispensing with gluings, blockings, and other framings underneath. 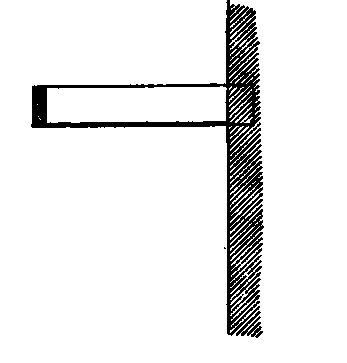 The tread is a loose thin slab of hardwood, nailed on to the top of the solid step, as Fig. 857. 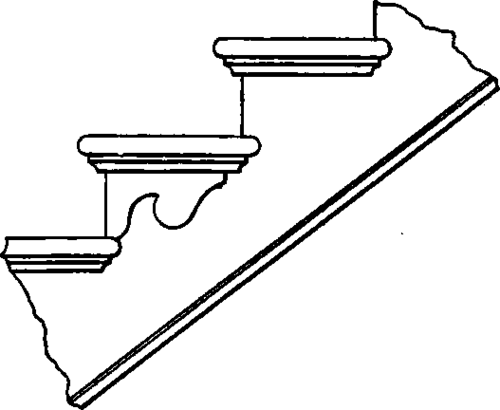 In ordinary stairs the treads are from 1 to 1 1/2 inches thick; risers, 7/8 to 1 1/4 inches; strings, 1 1/2 and 2 inches; balusters, 1 1/2 to 2 inches square; and newels, 4 or 5 inches square; and the other dimensions, of course, vary according to the circumstances, etc.